There are few things more satisfying than catching someone being a hypocritical scumbag. 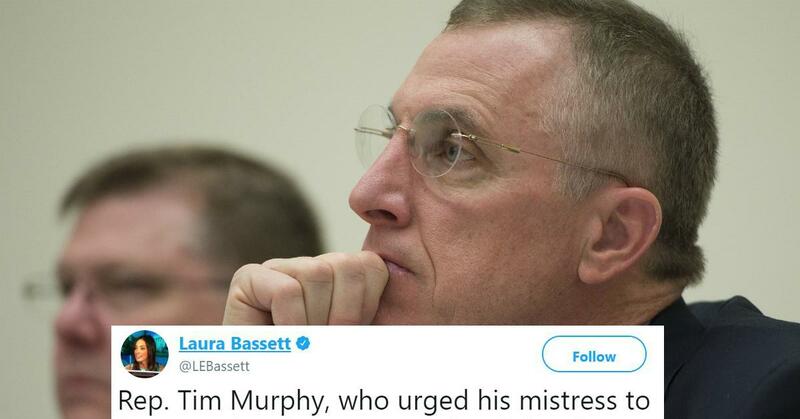 So you can understand why so many people were quick to come down hard on Pennsylvania Congressman Tim Murphy when he allegedly urged his pregnant mistress to get an abortion. That's because Tim Murphy is a staunch pro-choice opponent, but if it's for him to keep his infidelity under wraps, then apparently abortion is totally fine. "And you had zero issue posting your pro-life stance all over the place when you had no issue asking me to abort our unborn child just last week when we thought that was one of the options," Shannon Edwards texted Murphy. There was a ton of drama surrounding Murphy's blaring double standard, so much so that people started digging deeper to find out more about the man, and it turns out there was a lot more to dislike him for. Reports surfaced of Murphy being nearly impossible to work with and belittling employees to the point that his office had a turnover rate of over 100 percent. Murphy says he will dedicate this time to "healing" himself and his family. The scandal and Murphy's subsequent departure from Congress seems to be part of a trend of "house cleaning." This whole fiasco shows just how fickle political careers are. Paul Ryan was just touting Tim Murphy's mental health bill this morning. The day started so promisingly for Tim Murphy. But then again, this really is a huge blunder on Murphy's part. Tim Murphy is out here in Congress managing to have a position on abortion that pisses off absolutely everyone.